Website Design Home Remodeling Contractors Va Beach | For nearly a decade John Schwaebler and Steve Basciano has trusted VISIONEFX for all their online digital marketing needs. VISIONEFX provides on-going SEO work to drive traffic and visitors, attracting online leads and new projects for AC Decks year after year. Our expert staff understands how people search Google on desktop or search on mobile devices. We use our coding expertise to keep AC Decks in the top 10 Google rankings, year after year. 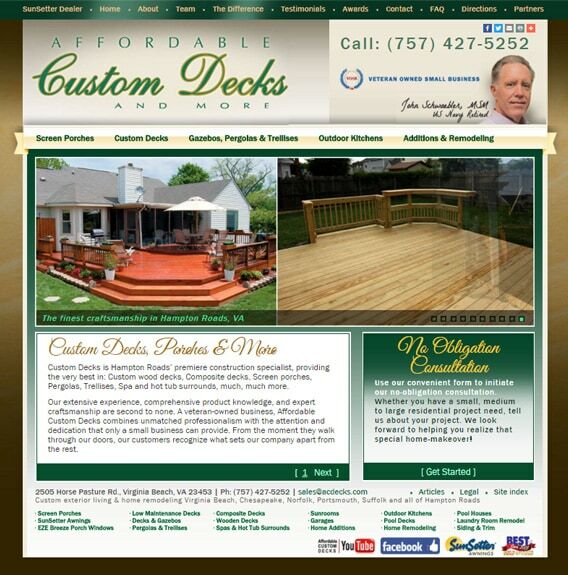 This is the 2nd website redesign for AC Decks since becoming a VISIONEFX client many years ago. For additional information about web design, custom web design or web development va beach contact here. VISIONEFX has great Google Reviews from verified customers posted on ‘Google My Business pages’. We invite you to read our reviews and contact our website customers. They will tell you our web design and web maintenance services are fast. Our speed and turn-around is second to none. For great branded website design for your building or contracting business builders call the website design experts at 757-963-1787 or use our online contact form here.